For some of you, the fact that black bear can be good eating is no great surprise: The hunting and eating of bears has been going on long before we out-competed the horrific (and thankfully extinct) cave bear for the best places to shelter ourselves from the rigors of the Ice Age. Bear hunting has been part of American life since we arrived in the 17th century, and roast bear has been on the menu for more than a few state dinners during our nation’s youth. Bear regularly made its way to market before the sale of wild game was outlawed in the early 1900s, and it retained a place in the American palate right through the late 1950s. One of the best-selling cookbooks of all time, Meta Given’s Modern Encyclopedia of Cooking (first written in 1947) includes a section on bear with helpful butchering tips, such as how to remove the scent glands behind the animal’s hind legs. Even more telling is that the 1957 edition of the Gourmet Cookbook includes three recipes for bear. Gourmet magazine has never catered to the redneck hunter crowd: Putting bear in their cookbook means it was a legitimate facet of haute cuisine. So why have I (and, I daresay, many of you) always felt ambivalent about eating bears? Was it watching Grizzly Adams as a kid? Winnie the Pooh? Maybe it was because I clutched a teddy bear every night when I was tucked into bed as a toddler. Hard to say. My personal experiences with black bears have been fleeting, and mostly annoying; they routinely pillaged my father’s garbage when he lived in the Watchung hills of New Jersey. When I’ve seen them, bear mostly have been an ink spot looking at me from a distant meadow, or a fading crash through the underbrush as the beast ran from my approach. I have never seen a grizzly bear. But something else is at work here, a cloudy notion that bears are somehow different from deer or ducks or upland birds. Bears manage to be cute and cruel all at once — most of us balance, uneasily, the mental image of the fuzzy, huggy bear of childhood with the knowledge that at least some bears will happily tear you apart and eat you alive, if given the chance. It’s worth noting that the only land animal that routinely hunts and eats humans isn’t the lion, or the alligator, or the tiger: It’s the polar bear. Then there is the biological fact that bears a) are omnivores like us, and b) are said to look a bit like people when skinned; I happen to think they look more like pigs. The American Indians put bears in a different spiritual place in part for this reason. Of all the things humans eat with any regularity, bears come closest to being us. Finally, there is the practical consideration that bear meat is insanely variable. Eat a bear that had been dining on berries and manzanita and you are in for a feast. Eat a bear that had gorged on salmon and it’ll taste like low tide on a hot day. What to do with the meat? In the kitchen, the most important thing you need to know about bear is that it is the single biggest vector for trichinosis in North America. Very few people get trichinosis from domestic hogs anymore, but they sure do from wild boar, bear and, oddly, walrus. To kill trichinae parasites you need to hit at least 135°F and hold it there for a long time, at least an hour. Safer to get the meat up to 145 to 150°F, which is medium — still pink, by the way. Ignore the old warnings about 180°F and such. Oh, and freezing won’t help you if you are north of about where I live, in Sacramento. Canada, Alaska and most of our northern tier states are home to a variety of trichinae parasite that doesn’t die in the freezer. Just keep this in mind. All this brings me to Siberian pelmeni, pretty dumplings widely eaten all over Russia. To me, no culture screams “bear” more than Russia. A look through the 1935 edition of The Derrydale Game Cookbook turns up Bear Steak Czar Alexandre, Breast of Bear in Sour Cream, Russian Braised Bear Liver, and the memorably named Fillet of Bear a la Zinoff. Apparently the original pelmeni were made with onions and bear meat (or venison) and frozen outside in the snow to be eaten on the trail by, you guessed it, bear hunters. Perfect! I used this recipe as a guide, although lacking whey I used buttermilk instead to make the dough. I also used a mixture of King Arthur white-wheat flour and spelt flour because I wanted a rustic, rough-hewn look to the dumplings. I mixed the flour and buttermilk, covered it and let it sit on the counter for 48 hours. It could have probably sat for another day, but it was reasonably sour nonetheless. As for my pelmeni filling, I ground two pounds of the bear meat, mixed it with a pound of my basic bacon, added pepper, a little salt, a little garlic and lots of onion. Onion seems to be a constant in pelmeni filling. 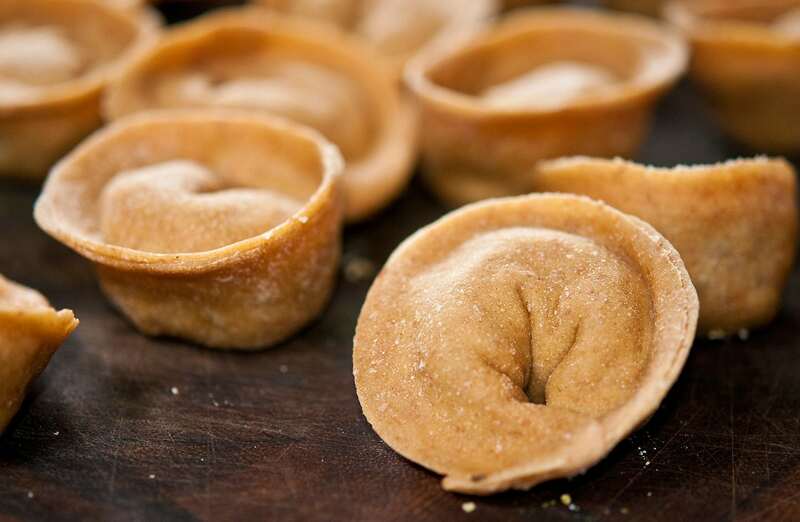 The dumplings are traditionally made by rolling the dough into a snake, then cutting off a walnut-sized piece and rolling it flat with a pin. I used my pasta maker instead. Way easier. I cut 2-inch circles from the dough with a cutter and in went a scant tablespoon of the filling. You fold the circle over into a fat half-moon, then pinch the edges to make a gigantic tortelloni. They were very, very good. A few dumplings cannot wash away a lifetime of ambivalence, but I feel differently about bear now. We all hold food prejudices — I won’t be eating dogs or cats anytime soon — and most are based on culture, not flavor. Some people lump bears into the dog-and-cat category, but growing up I’d read so many stories about early Americans eating bear that it seemed more antiquated than obscene; in my mind, bear had always teetered on the edge of acceptability. These dumplings pushed it over the edge for me. Eating the last dumpling, I thought of one of my favorite Swahili sayings: Wanyama ni nyama tu. All meat is meat. Even bears. 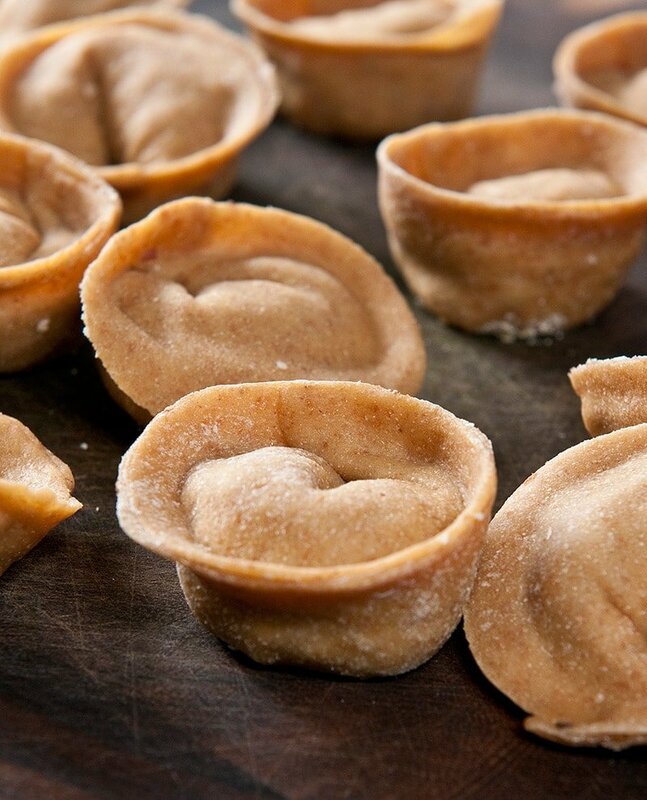 I made this pelmeni recipe with bear meat, but you could use any meat, really. You will need a lot of onion to go with it, as this is a defining feature of these dumplings. Traditionally pelmeni are made with sourdough, started with whey. You can substitute it for the buttermilk in the recipe. If you want to make a sourdough, you make a sponge with egg yolks and some of the flour and the why/buttermilk/milk and let it sit on the counter for a few days. Make sure your eggs are of the highest quality before you do this. Alternatively, you can just make the flour the day you serve the dumplings. Most people just boil their pelmeni and eat with something like sour cream and dill. If you are making the sourdough version, start 3 days in advance. Mix the spelt flour and salt with egg yolks and the buttermilk or whey into a batter, cover with plastic wrap and leave on the counter. Every day add 1/2 to 1 cup of regular flour, mixing well. Keep the dough covered. To make the filling, slice the bear and bacon into 1-inch chunks, making sure to remove all silverskin from the meat. Toss with the black pepper and garlic. If you are using uncured pork, like pork fat or pork shoulder, add 2 tablespoons kosher salt. If you are using bacon, salt pork or pancetta, add a teaspoon. Put the mixture in the freezer. Heat the oil or butter over medium-high heat and saute the onion until it just begins to brown, about 5-6 minutes. Move the onion to a sheet pan or large plate to cool. While the onion is cooling, you can make the quick dough or finish the sourdough. Mix the remaining flour with the rest of the dough ingredients and knead well. If you are doing a sourdough, you will need to punch the dough down before kneading. Add enough regular flour while kneading to make sure the dough is no longer sticky. Knead at least 5 minutes. Coat the dough with a little oil and cover with plastic wrap. leave it for at least an hour. Take the meat and fat mixture from the freezer and mix it with the cooled onions. Grind everything through a meat grinder fitted with the fine die. Alternatively, pulse everything fine in a food processor. Do not make a paste. Mix the meat well with your (very clean) hands and set in the fridge. Clean up before proceeding. There are two ways to roll out the dough. Traditionally, you roll the dough into a long snake the diameter of a walnut. Cut off pieces and roll them flat with a rolling pin; you want them to be 1/16 of an inch thick. Or, is you have a pasta maker, roll the dough out to a medium setting. My Atlas’ thinnest setting is No. 9, so I went to No. 5. Cut out 2-inch circles with a cutter or wineglass. Fill each dumpling with a scant tablespoon of filling. Fold over the circle into a half-moon and, if you want, pinch the ends of the half-moon together to make a circular dumpling that has a rim. Boil the dumplings for 6-8 minutes to make sure the bear or pork has fully cooked. Serve with sour cream mixed with dill and black pepper. This recipe makes a lot of dumplings, but they freeze really well. Don’t worry: You’ll eat them up fast! Explore all kinds of recipes for bear and wild pigs here on Hunter Angler Gardener Cook! I ate bear for the first time this summer while interning with MN DNR Fisheries. We had a volunteer out on the lake with us who was a usual volunteer. For lunch break he invited us into his home which was decorated with mounts of every subspecies of caribou in North America. After the grand tour and stories of bow hunts he brought us over to his slow cooker and within was the bear. It was absolutely everything I’ve heard bear wasn’t. It was delicious and hardly anything that would make you associate it with something other than beef. You could only tell it wasn’t beef because there was a subtle flavor of wild in the mix but it was good. Just like Hank said above,”This was some damn good bear”. Again I recently also had the opportunity to eat bear when my classmate shot one about a month back. We simply pan fried the bear chops in butter and didn’t season it with anything overly special. Once again the flavor was great and more akin to the best steak you could ever have. This time we couldn’t tell we were eating something wild. There was a complete absence of game flavor it was purely beef and I like a hint of wild because it lets you know you’re eating something from nature. I also just really like that wild flavor so it was almost a disappointment in that aspect but amazing still. I’ve had beer- jerky and roast – and enjoyed both a great deal. I too am ambivalent towards bear tho. I don’t see them in the wild and think “yum” like I do with elk, deer etc. I don’t look at them and think of them as food for some reason, which is why I don’t hunt them. We supplement our moose and buffalo freezer stash with a black bear about every 2-3 years. The bears on blueberries are the best. Meat in Alaska is super expensive so hunting is the traditional lifestyle. Bear grease was an important part of the diet of many American Indians. It was also common for them to rub it on their skin in winter time to help stay warm. (Remember: they didn’t take hot showers on a regular basis like we do today.) Rendering down a bear for its fat was common practice. Bear grease was used in many ways. The best bear I ever had was in Alaska where the black bear had been feasting on blueberries and crow berries for a month. The camp cook rubbed it in garlic and braised it low and slow for hours. It tasted like prime beef with one of those subtle tuna sauces from Italy that they use on braised beef over there. Delicious! To this day I want to go bear hunting again.